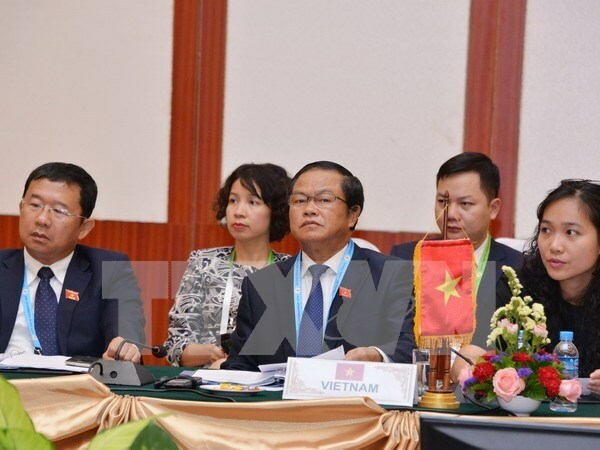 Vientiane (VNA) – ASEAN Inter-Parliamentary Assembly (AIPA) leaders gathered in Vientiane, Laos, for a meeting with ASEAN leaders on the occasion of the 28th & 29th ASEAN Summits, reiterating their support for the building of a peaceful, stable and developing ASEAN Community. Vice Chairman of the National Assembly Do Ba Ty led the Vietnamese delegation to the event. He spoke highly of the draft AIPA Chairman’s statement which fully reflects the common concerns of ASEAN and in line with the bloc’s documents, especially the Joint Statement adopted at the 49th ASEAN Foreign Ministers’ Meeting (AMM-49) in Laos. The draft Statement also demonstrates ASEAN’s interest to boost relations with AIPA for the goal of building an ASEAN Community of peace, stability and development, he said. During the AIPA-ASEAN leaders’ meeting, the Speaker of Malaysia’s House of Representatives presented the AIPA Statement on the implementation of ASEAN Community Vision 2025 across three pillars. On the political-security pillar, AIPA acknowledged the importance of navigation security and supported efforts to maintain and promote peace, stability, safety, security and freedom of aviation and navigation in the East Sea. It suggested increasing mutual trust and restraining from actions that could complicate the situation while addressing disputes peacefully in line with international law, including the 1982 United Nations Convention on the Law of the Sea (UNCLOS). AIPA also supported the full and effective implementation of the Declaration on the Conduct of Parties in the East Sea (DOC) and urged the involved parties to reach a Code of Conduct in the East Sea (COC) as soon as possible. It emphasised the need to double efforts to fight terrorism, boost cooperation in intelligent information and promote the culture of dialogue. The assembly expressed its concern over illegal fishing and trading of timber and wild animal in the region. Economically, AIPA urged countries to nationally legalise ASEAN agreements towards the implementation of the Vision of the ASEAN Economic Community (AEC) and ensure benfits for people at the grassroots level and micro, small- and medium-sized enterprises. In the process of building a common market with free movement of workers, ASEAN needs to reduce development gaps and enhance capacity of CLMV members (Cambodia, Laos, Myanmar and Vietnam), through the Initiative for ASEAN Integration and the ASEAN Framework for Equitable Economic Development. As regards culture and society, AIPA recognised the significance of the ASEAN Socio-Cultural Community (ASCC) and pledged to continuously support the bloc to realise the ASCC Blueprint 2025. It stressed the need to increase public awareness about ASEAN and ASEAN identity. Towards the celebration of the 50th founding anniversary of ASEAN (1967-2017), AIPA confirmed it will cooperate with ASEAN to maintain peace and social-economic development. Addressing the meeting, Vietnamese Prime Minister Nguyen Xuan Phuc highlighted the crucial role of AIPA member legislatures and law makers in ASEAN connectivity, especially in supporting the realisation of targets set in the ASEAN Vision 2025 – particularly two major goals of building a truly “rule-based” and “people-oriented and people-centred” community. The Prime Minister proposed AIPA accelerate the approval and implementation of ASEAN legal documents and agreements as well as work with their governments to ensure ASEAN policies and cooperation programmes benefit people, and promote the coordination between executive and legislative authorities. During his stay in Vientiane, National Assembly Vice Chairman Do Ba Ty paid courtesy visits to Lao Party General Secretary and President Bounnhang Volachith, Lao National Assembly Chairwoman Pany Yathotou and met with Lao National Assembly Vice Chairman Bounpon Buttanavong.